Sleep is one of the most important contributors to your health and well being. Sleep apnea is a condition that threatens your sleep quality with short lapses in breathing while you’re asleep. This can lead to oxygen deprivation, which in turn can cause you to wake up. This sort of interrupted sleeping pattern is not only annoying; the resulting lack of sleep can damage virtually every aspect of your life, from your career to your relationships. It can also be life threatening. Many sleep apnea patients find relief from nasal continuous positive airway pressure (CPAP) therapy. You can see your doctor to get fitted for an oral appliance that assists you with getting enough oxygen while you sleep. 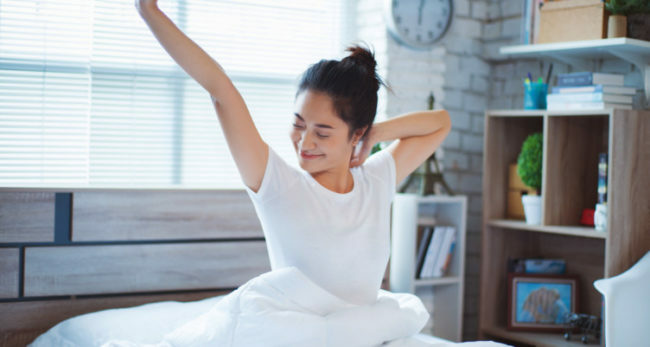 Staff at University Health News points out that this is the most commonplace conventional sleep apnea therapy, and that it is effective for many sleep apnea patients. However, some people have a hard time tolerating CPAP therapy. Whether or not you find CPAP therapy effective, you might want to try some of the other available therapies for healing sleep apnea. They’re positive, healthy suggestions that have no downsides. Your sleeping posture can make a significant difference in the severity of your sleep apnea. Researchers have found a correlation between severe obstructive sleep apnea and a supine sleeping position. The main takeaway: Don’t sleep on your back. Instead, try training yourself to sleep on your side. There’s a distinct relationship between your sleeping position, your comfort level and the mattress you’re sleeping on. Even using the right kind of mattress topper can change your sleep quality completely. Your sleeping posture is likely to vary dramatically, depending on the level of firmness native to your mattress. The experts at Ecosa recommend a firm or medium-firm mattress for correcting problems with sleep apnea. They point out that pressure point support is crucial for avoiding stress on your back while you’re sleeping. They recommend considering a gel foam mattress that’s compatible with an adjustable bed base for best results. Alcohol and coffee consumption can both interfere with healthy sleep patterns. Both should be avoided in the duration of time leading up to your usual bed time. Smoking can result in inflammation of your airways, which can, in turn, aggravate sleep apnea. If you smoke, make it a top priority to quit immediately. Whether or not you smoke, you’ll also want to take care to avoid breathing in secondhand cigarette smoke. Politely ask your smoker friends to go outside if they feel compelled to light up a cigarette. If you don’t already live in the tropics, you might want to try using a humidifier at night while you sleep. Humid air could help to clear your nasal passages and encourage you to breathe more clearly. Kiara Anthony at Healthline.com also recommends using aromatherapy with several different essential oils: eucalyptus, peppermint and lavender. These three essential oils are excellent choices for sleep apnea patients because they all offer soothing, anti-inflammatory properties that can encourage restful sleep. There’s often a correlation between obesity and airway obstructions. If you’re overweight, slimming down could help to make a significant difference in the severity of your sleep apnea. Depending on your circumstances, you might even be able to entirely get rid of your sleep apnea by simply losing weight. A combination exercise program that includes aerobic exercise and weight training is particularly helpful for sleep apnea patients. This sort of program can help you to feel more energized, even if your sleep quality is still not the best. There’s a correlation between sleep apnea and oxidative stress. When you suffer from oxidative stress, you have a situation where your body is coping with more free radicals than is ideal. Antioxidants are the key to ridding yourself of this oxidative stress. In particular, increase your levels of vitamin E by consuming sunflower seeds, almonds, hazelnuts and other foods rich in vitamin E.
These 8 things are likely to help you find relief from sleep apnea. Please keep in mind that these suggestions are not intended to take the place of a consultation with a qualified healthcare professional. If you’ve been diagnosed with sleep apnea, we highly recommend discussing this list with your doctor so you can enjoy the benefits of professional advice that is tailored to your specific circumstances.